We can help! Digital Workshop Center (DWC) is re-modelling some of our space to provide more private office space at our Fort Collins campus. Since 2006, DWC has been a center for professional development, coworking, and community. Our shared office space provides a flat fee solution for your growing business or professional workspace. In a shared office space at DWC, you will have amenities including meeting rooms, phone booths, discounts on classes, unlimited coffee and snacks, and so much more. You will also be joining an eclectic community of entrepreneurs, small business owners, remote workers, and like minded individuals who enjoy shared office resources. Why is DWC shared office space different? As a private occupational school in Colorado, we strive to create a quiet, professional space to allow you to thrive. Community is a huge part of who we are, and our students and instructors bring their experiences into the community along with the coworking members. As a school, our coworking space is an inviting, warm place to work with minimal distractions. We ask all members to be respectful while using the shared space. Instead of social activity in the coworking space, we offer other social events outside of the building. We want our members to interact and work together, but think shared office space and coworking desks should be a place to get your work done first. Schedule a time to come by DWC in Old Town Fort Collins and see if a shared office space is best for you. 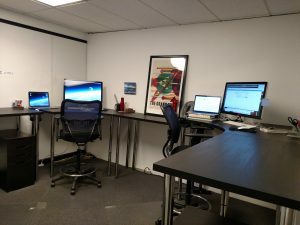 Private offices, flexible desks, and fixed desks are all available within different packages. As a locally owned business, we can find a membership plan that will work for you and your budget.